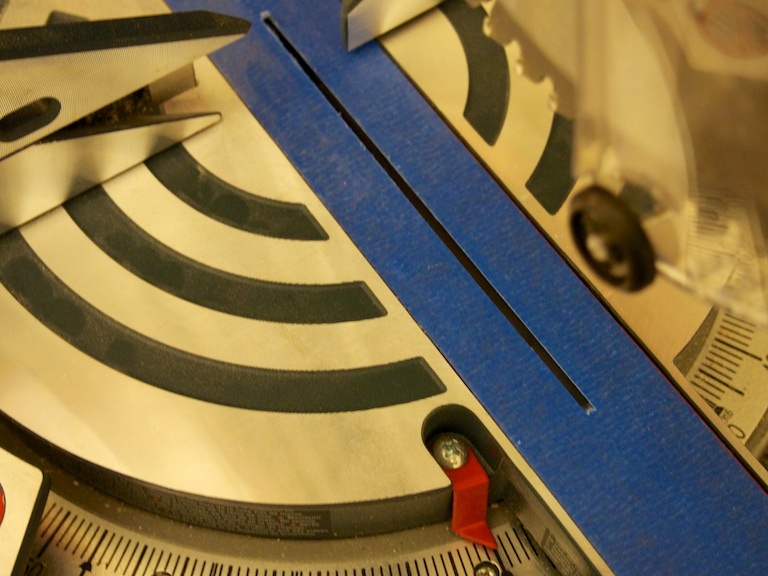 A zero clearance insert on a miter saw (or any saw) is an insert that goes right up to the edge of the blade. You'd typically make one of these by starting with a blank insert and then cutting the opening for the blade after the insert is installed. Each insert you make is specific to each blade, and you can't vary the blade's bevel without altering the insert. The advantage to the inserts is that they give you a convenient edge for lining up your cut, and they reduce tearout (chipping on the bottom of the board). I was looking for a zero clearance insert for my new Bosch CM8S, and came across this zero clearance tape by FastCap. The insert on a miter saw is slightly recessed, so there's room to apply a layer of tape over it, without causing interference. FastCap uses a "durable PVC tape". I considered electrical tape and duct tape, but the former has a tendency to curl and I was afraid the latter would leave a mess, so I tried painter's tape. It seems to be working relatively well. I'm not getting any tearout on the door casings that I'm cutting, though I haven't tried any plywood. I imagine a firmer insert would do better in this regard. As far as providing a clear edge for lining up the cut, it's excellent.